Coaching teachers in schools is integral to supporting effective teaching methods. This teaching resource provides practical instructional coaching strategies for teachers and educators. Instructional coaches play a crucial role in helping educators meet the ever-changing demands placed on teaching and learning. 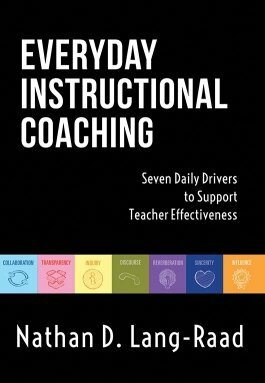 With this practical guide, coaches will discover seven drivers they can use to best support teachers in their daily work: (1) collaboration, (2) transparency, (3) inquiry, (4) discourse, (5) reverberation, (6) sincerity, and (7) influence. Each chapter offers instructional coaching strategies, research, and examples to help readers evaluate, refine, and implement these drivers in their educational coaching practices. Explore the seven daily drivers necessary to become a more effective instructional coach. Gain strategies to strengthen relationships and improve outcomes with teachers and teacher teams. Access tools to help self-assess and adjust daily coaching practices. Understand the sociocultural psychology and education research that support the seven daily drivers. Learn approaches you can use to keep pace with the demands on today’s educators, coaches, and instructional leaders.